Tickets are on sale now for the remaining three performances: Friday, April 27 at 7 pm and Saturday, April 28 at 2 pm and 7 pm. Join us for a heartwarming tale that follows a stuffed toy in his quest to become “real.” The devoted little rabbit learns that love makes a “real” difference as he discovers the meaning of friendship. Don’t miss this story of loyalty and determination as seen through the eyes of a very special bunny. 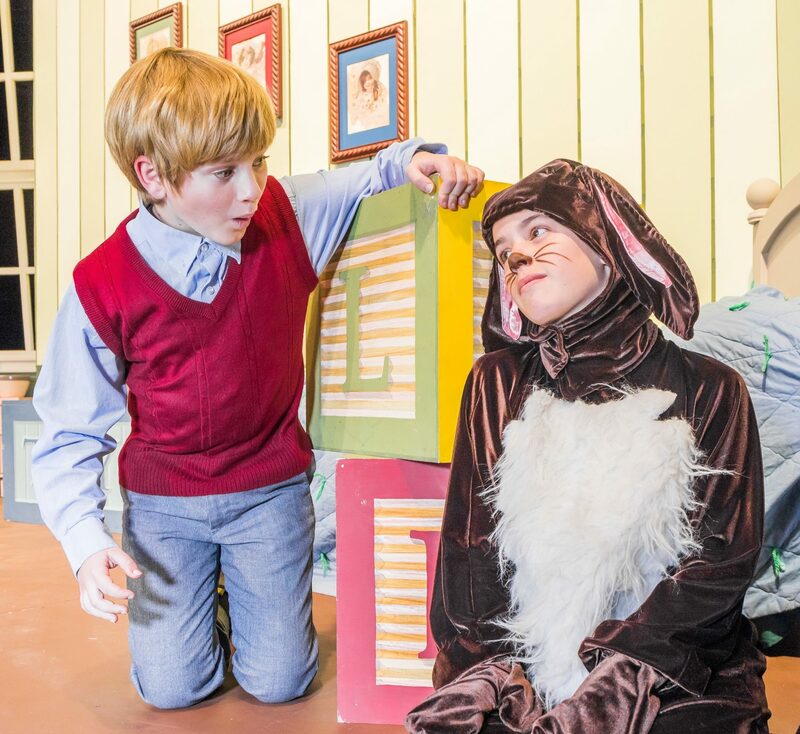 The Boy (Paul Webster) enjoys spending hours playing with the Velveteen Rabbit (Tatum Ramones). Photo by Sam Bailey. 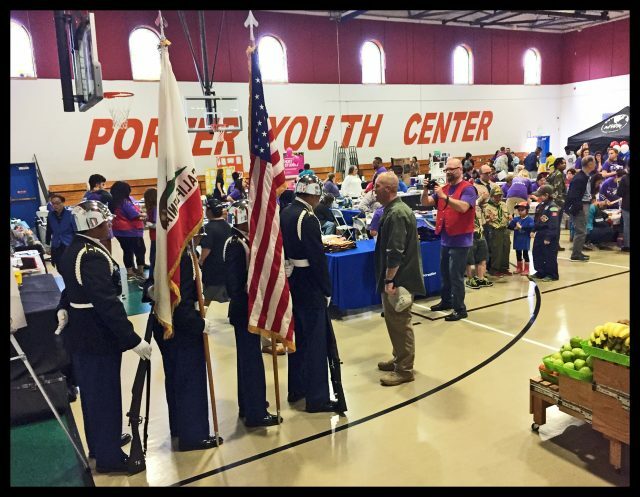 The Celebration of Military Children occurred on April 7, 2018. 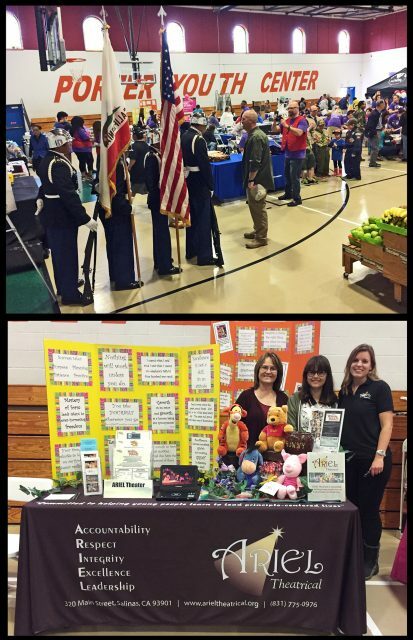 There were presentations and speeches in support of the children of military families who are annually recognized for their resiliency and important role in the military family. At the event, we engaged children and families with drawings for discounted or free tickets to productions, while educating them about ARIEL programs and answering questions they may have about our mission. Gladly representing ARIEL Theatrical were: Sandra and Renee Ortega, volunteers; Heather Kirk, executive director; Frank Kragh and Alan Liddle, ARIEL Board trustees. 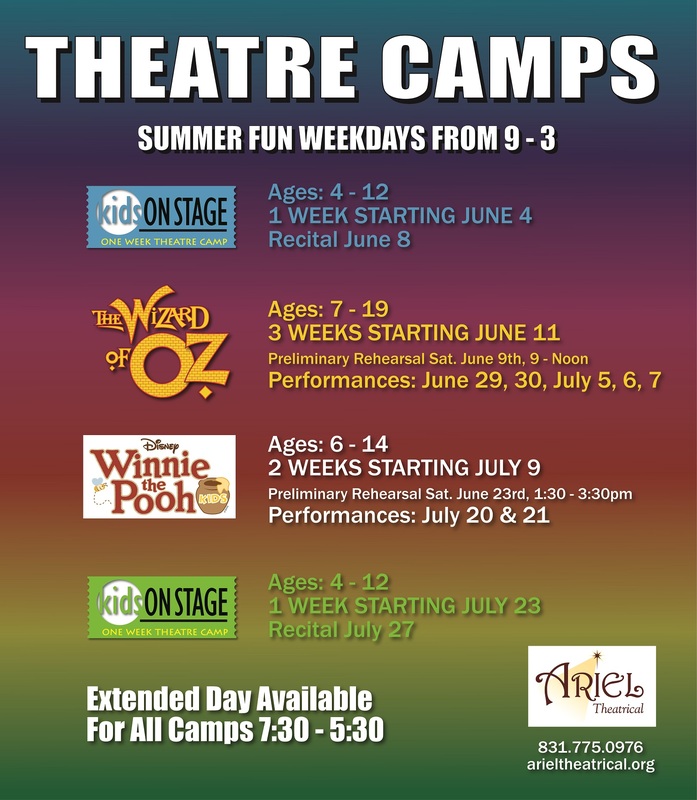 Registration is open for Summer Programs at ARIEL Theatrical – Day Camps, Community Show and performances for all ages! Space is limited so don’t delay – check your schedule and register today! 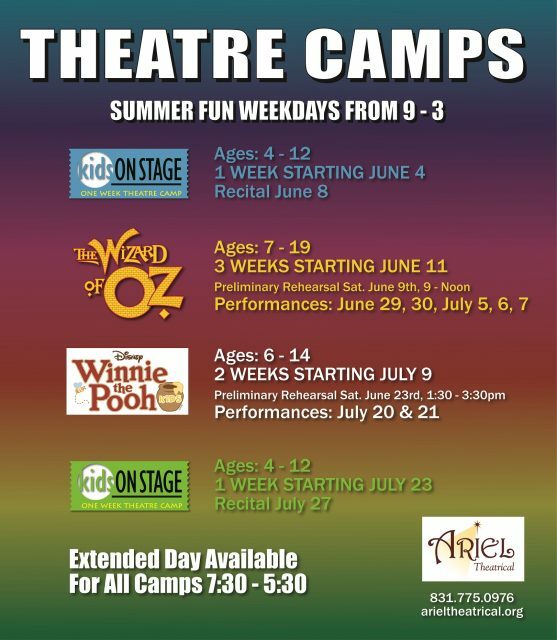 Sing, dance and celebrate summer with ARIEL Theatrical! Meet new friends and have an unforgettable adventure on stage. One, two and three-week day camps (9 am – 3 pm) with an extended day option (7:30 am – 5:30 pm) will allow for flexible drop-off and pick-up times. Try something new this summer at ARIEL! KIDS ON STAGE – Two sessions, June 4-8 and July 23-27. Children ages 4-12 are welcome to participate in these one-week camps that will teach musical theatre basics and give them a chance to try out their new skills on stage. Each camp concludes with a recital for family and friends. The Wizard of Oz – is a three-week camp Mondays-Fridays, June 11-29 with performances on June 29, 30, July 5, 6 and 7. Follow the Yellow Brick Road with Dorothy, the Scarecrow, the Tin Man and the Cowardly Lion as they meet the Munchkins, bargain with the Wizard and contend with the Wicked Witch of the West. Youth ages 7-19 comprise this “Over the Rainbow” cast that will bring L. Frank Baum’s classic to life. Disney’s Winnie the Pooh KIDS – is a two-week camp, Mondays-Fridays, July 9-20 with performances on July 20 & 21. 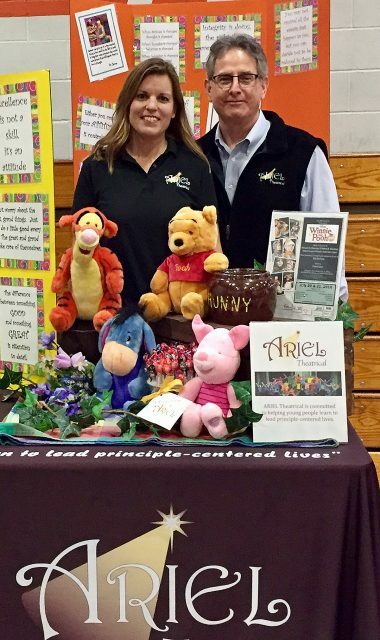 Welcome to the Hundred Acre Wood, where Winnie the Pooh is once again in search of honey. Along the way, he meets his pals, Tigger, Piglet, Rabbit and Owl, but soon discovers that Christopher Robin has been captured by the mysterious Backson! As they prepare for a rescue operation, the animals learn about teamwork, friendship and, of course… sharing snacks. Young people ages 6-14 are invited to register. The Hunchback of Notre Dame – Based on the Victor Hugo novel and songs from the Disney animated feature, The Hunchback of Notre Dame showcases the film’s Academy Award-nominated score. Be part of an epic adventure that will sweep audiences away to another time and place. Rehearsals begin Saturday, June 16. Open to high school and adult participants. Performances are on August 3, 4, 10, 11, 17 and 18.